1. Heat 1 tbsp olive oil in a large pan with a tightly fitting lid. Deseed and slice 3 essential Waitrose red peppers, then cook, covered, for 10 minutes, adding 2 garlic cloves, crushed, and a pinch of chilli flakes for the last 2 minutes. 2. Pour in ½ x 680g jar passata with chopped basil, season and simmer for 10 minutes. 3. Meanwhile, finely chop 8 mint leaves and mix with 1 tbsp olive oil. Rub this mixture over 4 essential Waitrose lamb leg steaks. Season and pan-fry for 4 minutes each side. 4. Tear 3 basil leaves and add to the peppers. 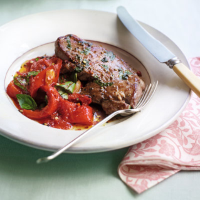 Serve the lamb with the peppers and a salad or steamed green vegetables, if liked. This recipe was first published in Sun May 01 14:52:00 BST 2011.